On Sunday morning, a dear friend of ours passed away after battling cancer for several years. Please pray for the repose of the soul of Fr. 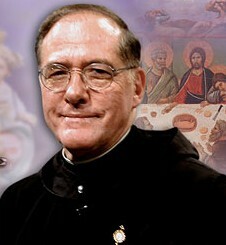 Jacques Daley, OSB, a member of St. Vincent’s Archabbey in Latrobe, Pennsylvania. Fr. Jacques had been a friend of the monastery for many years. He had three series on EWTN, and was well known for his love of St. Therese. He was very devoted to Eucharistic Adoration and Our Lady. We will miss him dearly – Fr. Jacques had a special gift of joy and humor, united with deep spirituality, and we are most grateful to Our Lord for his life, his priesthood, and his friendship. Here is a video St. Vincent’s posted yesterday, of Fr. Jacques recounting his vocation story. O God, Thou didst raise Thy servant, Jacques, to the sacred priesthood of Jesus Christ, according to the Order of Melchisedech, giving him the sublime power to offer the Eternal Sacrifice, to bring the Body and Blood of Thy Son Jesus Christ down upon the altar, and to absolve the sins of men in Thine own Holy Name. We beseech Thee to reward his faithfulness and to forget his faults, admitting him speedily into Thy Holy Presence, there to enjoy forever the recompense of his labours. This we ask through Jesus Christ Thy Son, our Lord. Amen. This entry was posted in A Nun's Life and tagged Fr. Jacques Daley OSB, prayers for the dead by texasnuns. Bookmark the permalink. Fr. Jacques and I went to Europe traveling to many holy sites together. I met him at MotherAngelic’s shrine in Hanceville. At the time I worked for Delta Airlines ,since I wasn’t married he became my spouse on my free passes. For many years we traveled together he became a very close friend his personality was so real he was so full of fun and truly very holy. We were both involved in the divine will .and made a series for EWTN called font of Mercy. Miss him wonderful memories. I met Fr. Jacques at St. Cyril and Methodius Church in Sterling Heights, MI. He was the kindest, most joyful and spiritual priest I have ever met. He made time for everyone and left them feeling God’s love. I will miss him but I am happy he is in God’s loving arms. We miss him, too! But we are praying for him and praying to him – we have already given him along list of intentions we need him to help us with. Beautiful loving tribute, only love can be repaid with love . Thank you Jesus! Loved Fr. Jacques, we went to Rome and Poland together. Because I worked for Delta Airlines Father had my flight benefits. We made Font of Mercy, for EWTN and were both involved with the Divine Will miss him very much.